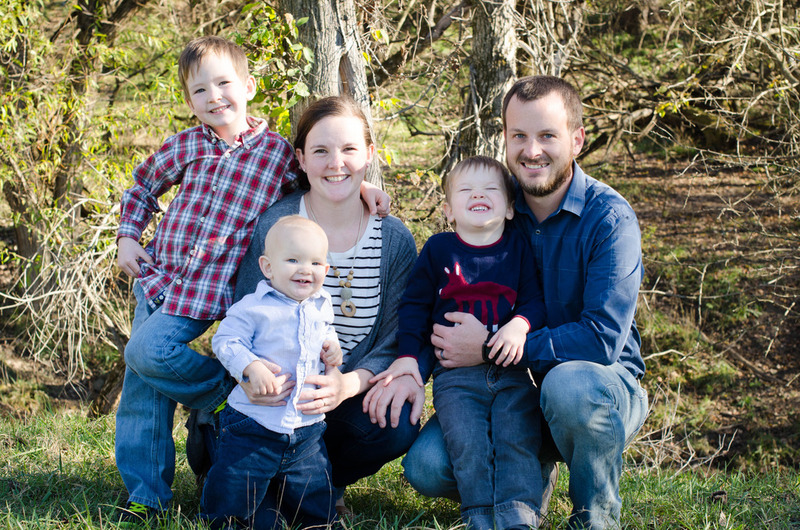 We're spending this fourth week on gift ideas for the guys! 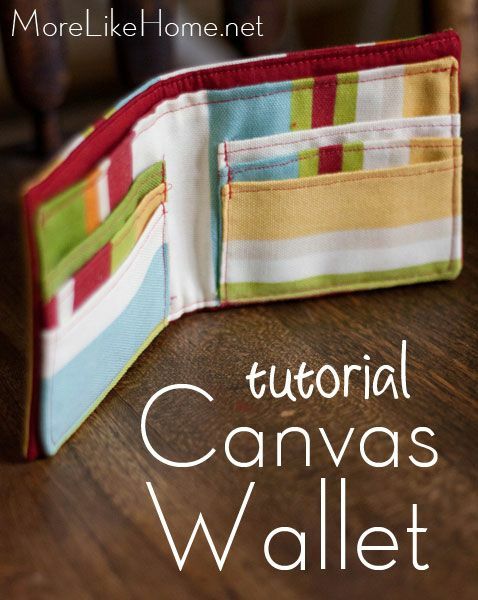 And today we're making a handy canvas wallet. 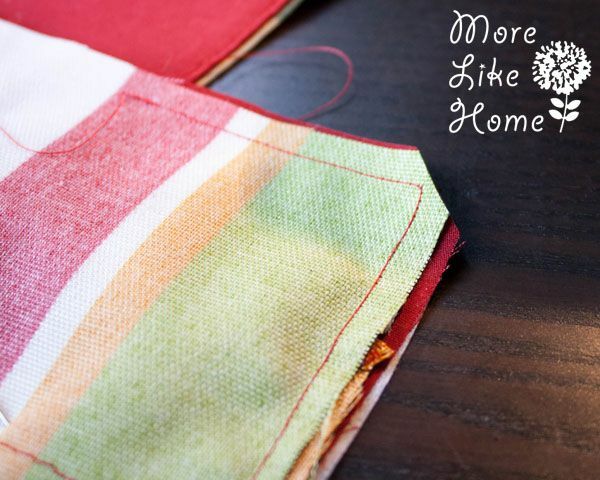 It's easy to make and doesn't take much fabric so it's pretty cheap. And of course it folds up to fit in his pocket. It has room for all your monies (a $2 bill was literally the only cash I could find in the house. Win.) 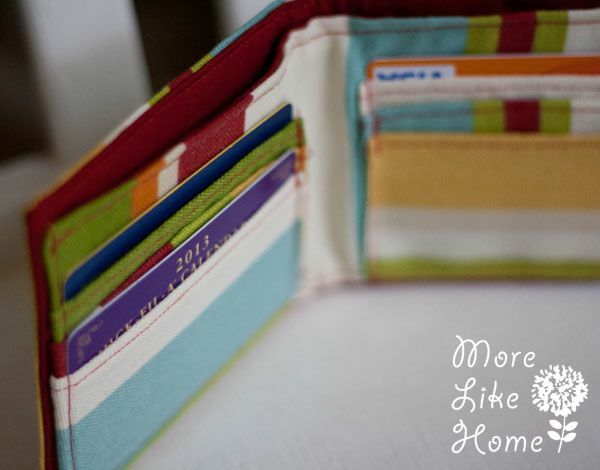 and six card pockets for credit cards, library cards, and of course that handy chik-fil-a card! 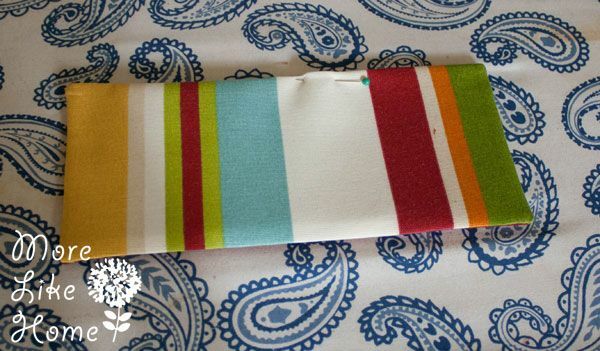 I love this fun beachy stripe print. It's fun twist on a traditional wallet! But of course you can use any print or color you like. If your guy is a bit more traditional a solid black would be spiffy, maybe with a pinstripe lining? 1 outer body - 9 x 4.5"
1 inner body - 9 x 4.25"
6 pockets - 4.5 x 2.5"
Apply the interfacings to the back sides of the lining fabric. 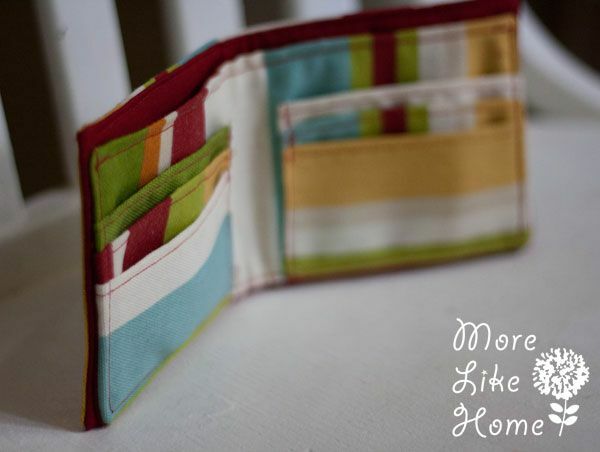 Now you can make the outer piece of the wallet. 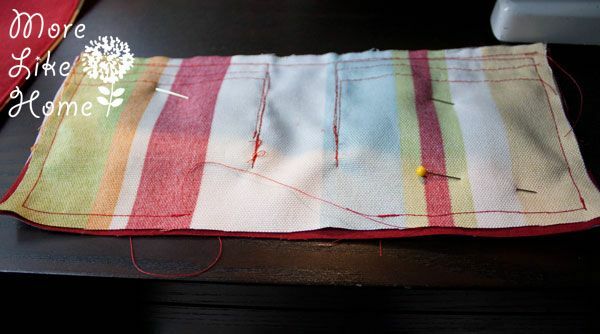 Place the outer body on top of the outer lining with right sides together. 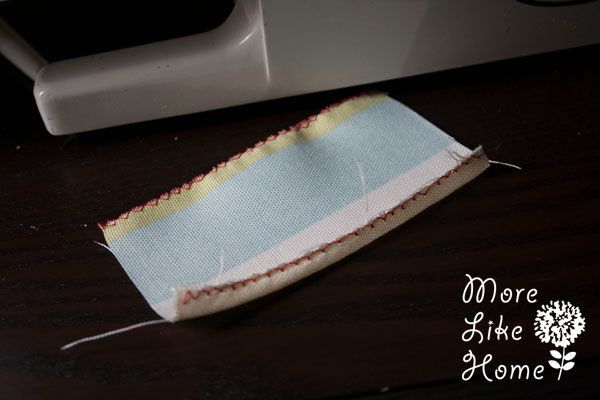 Sew around the edges with a 1/4" seam allowance, leaving a 3" opening in one side for turning. Flip it right-side out through the opening and push the corners out nice and square. Tuck the fabric in at the opening and pin it closed. Iron the whole thing, especially the edges. You want it looking all sharp and spiffy. 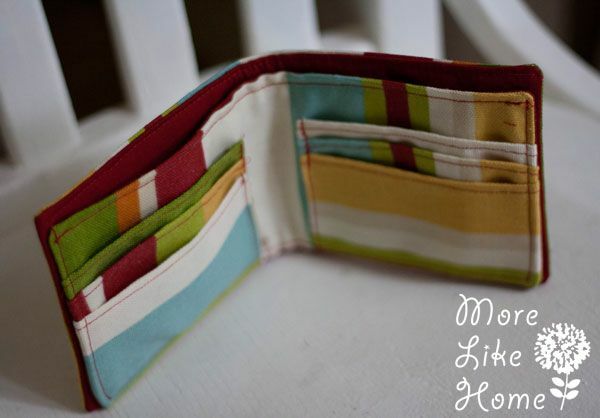 Sew right along the top edge of the wallet. 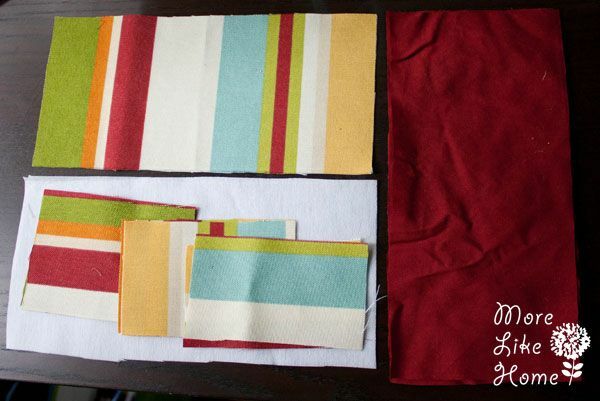 Now we'll make the inner section, starting with the pockets. 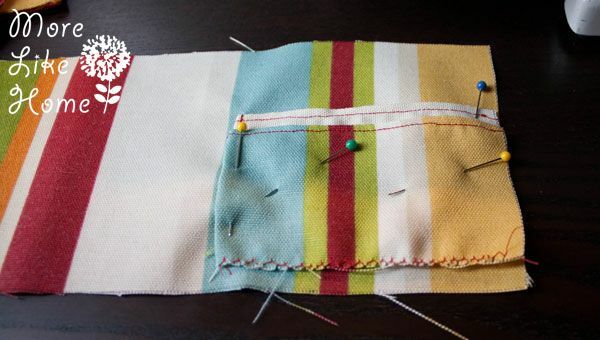 Serge or zig zag stitch along both long edges of each pocket to keep them from fraying. 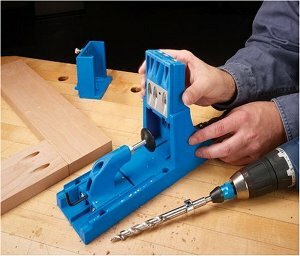 Press one long end under 1/4". This will be the top edge of the pocket. Repeat for all the other pockets. 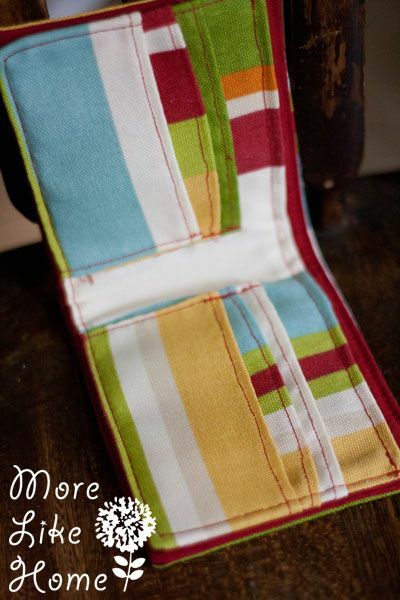 Sew right along the top folded edge. Now on three of the pockets serge or zig zag stitch along the right side. On the other three serge or zig zag stitch along the left side. Then press the serged edges under 1/4" (I don't have a pic of that step). 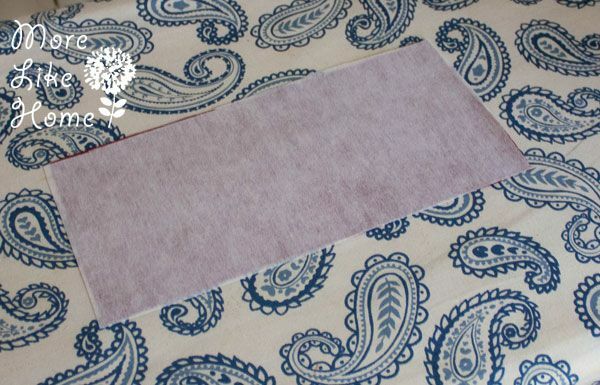 On the inner piece of canvas, pin the first pocket in place. 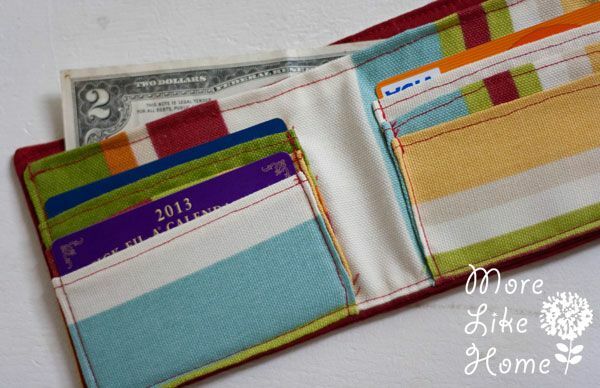 Use a pocket with the left side pressed under and line up the raw right side with the right edge of the wallet. Set it up 1/2" from the bottom edge of the wallet. Pin it in place. 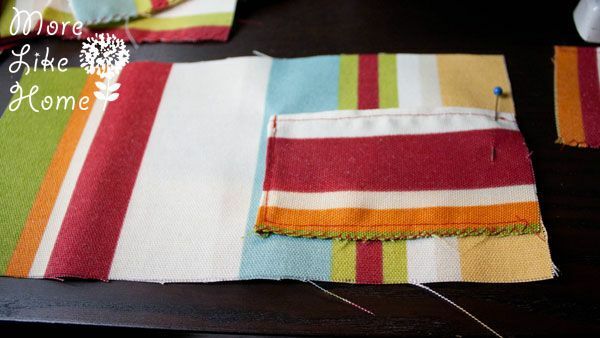 Sew along the bottom of the pocket with a 1/4" seam allowance, turn the corner, and sew up the folded edge, right along the edge. Pin the next pocket right on top of the first, but this one will be set up just 1/4" from the bottom of the wallet (so the first pocket will show 1/4" above the top of this one). 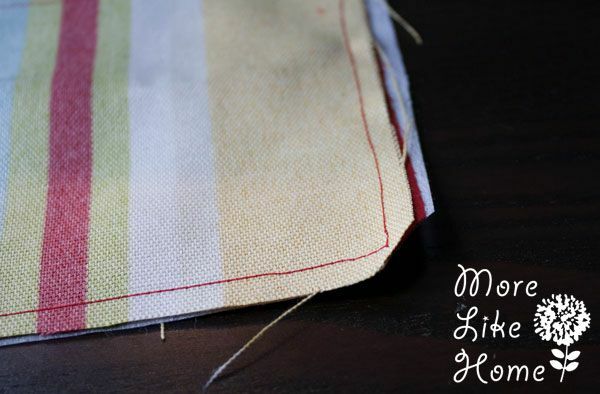 Sew along the bottom edge with a 1/4" seam allowance, then right along the folded edge. Pin the third pocket right on top of the second. 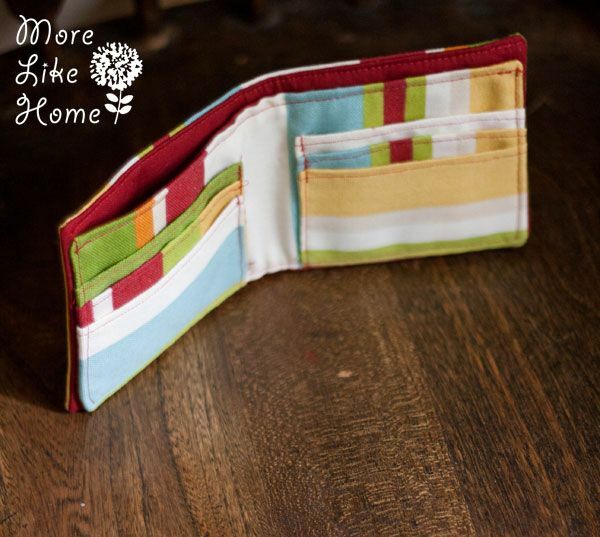 The third one should be lined up with the bottom of the wallet (so the second will show 1/4" above it). 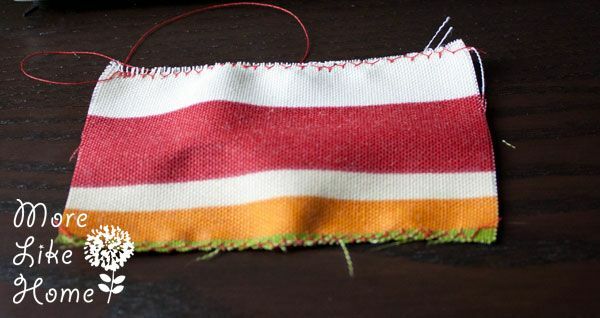 Sew along the bottom edge with just under a 1/4" seam allowance (to make sure it doesn't show later!) and the up the folded edge, right along the edge. 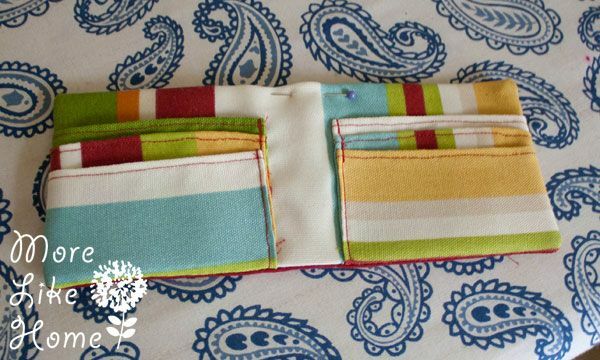 Use the same steps to put the remaining three pockets on the left side of the wallet. Lay this piece face down on top of the inner lining piece with right sides together. 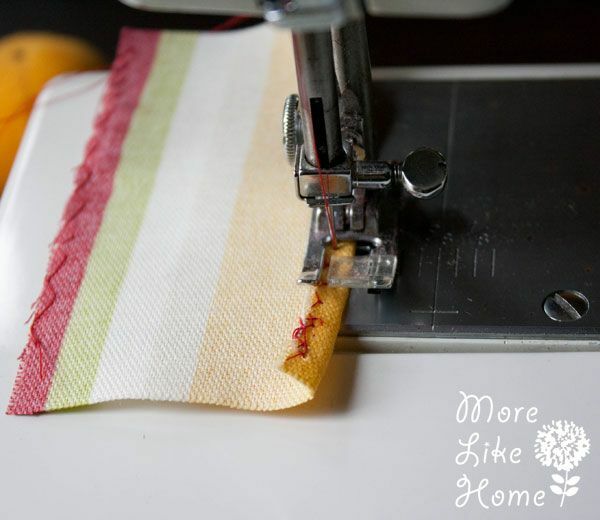 Sew around the outside edge with a 1/4" seam allowance, leaving a 3" opening at the top for turning. Flip it right-side out through the opening and push the corners out. Tuck in the fabric at the opening and pin it closed. Press the whole thing. 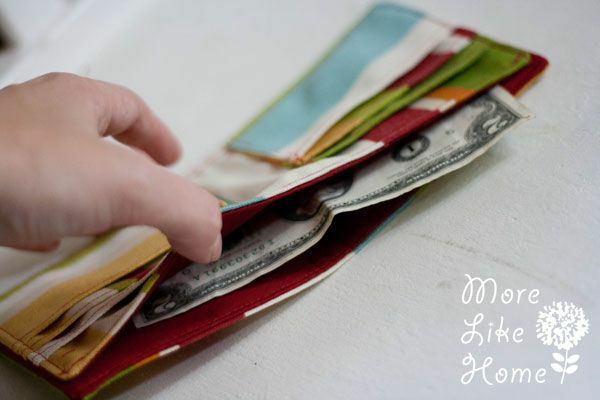 Then sew right along the top edge of the wallet (just like you did with the outer body piece). Now lay this inner body piece on top of the outer body piece you made earlier with the lining pieces together and pin it. You want it put together just the way it will look when it's done. 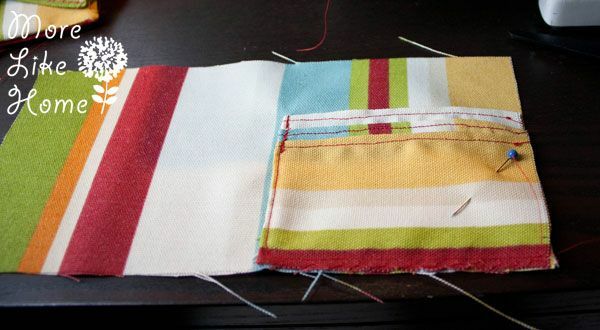 Sew right along the sides and bottom edge of the wallet (don't sew the top edge!). 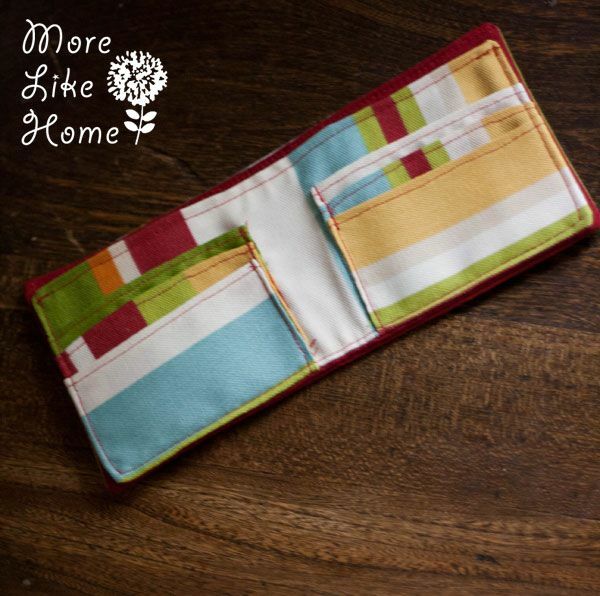 This is great to give as-is, or you could stick a favorite gift card in one of the pockets. Or you could put some cash in it for a fun graduation gift. And they're small enough to use as stocking stuffers! But wait. There's more. 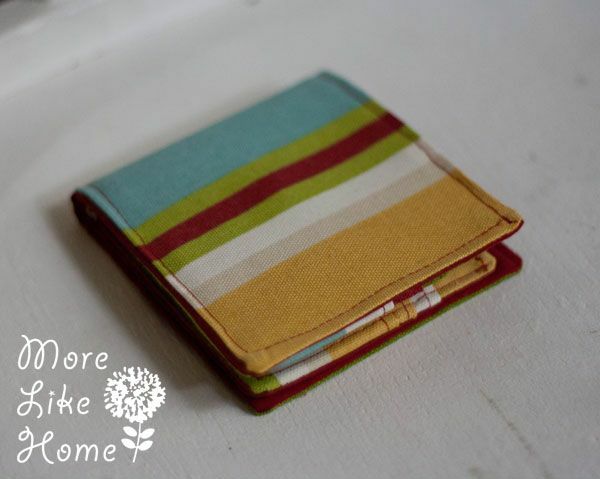 You'll have enough fabric here to make two wallets so it's actually only $2.00 per wallet! And even better yet... since it uses just a few small pieces I was able to make the whole thing out of scraps.... so mine was totally free!! 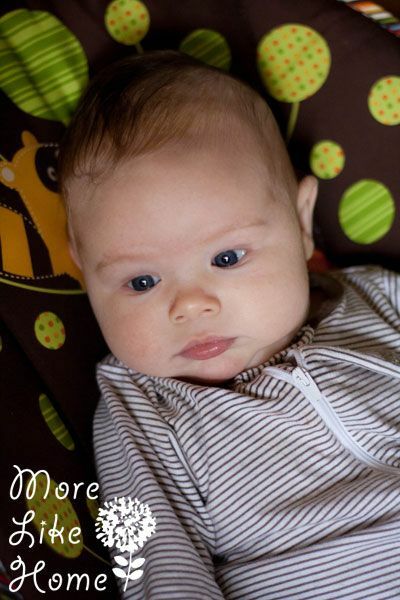 Giant Monster Baby chilled in his seat for all of three minutes at a time. 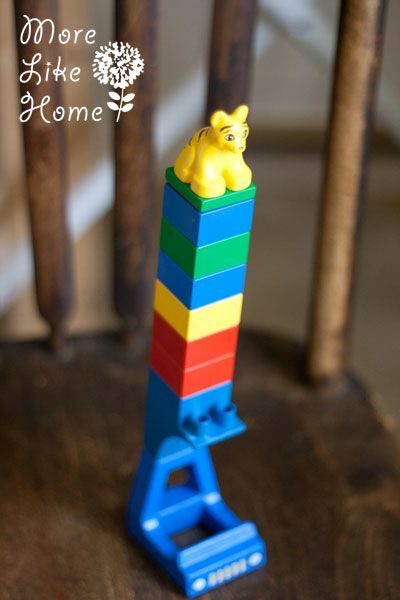 Small Boy played made lego towers making sure to stay within 2" of the wallet at all times. 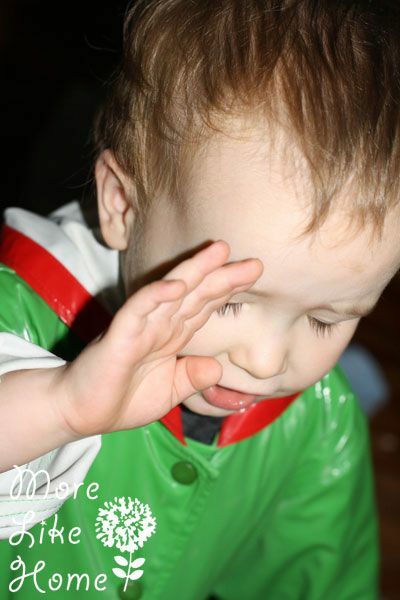 When he realized I was taking pictures he said "Mama! B makin' somfin'! 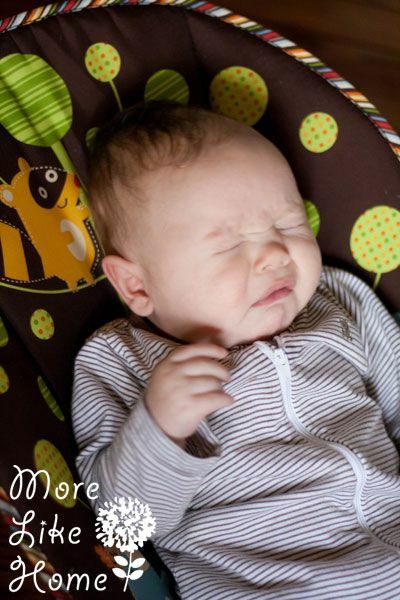 Mama take picture!" He checked to make sure I had a picture of it. So I turned it back off. 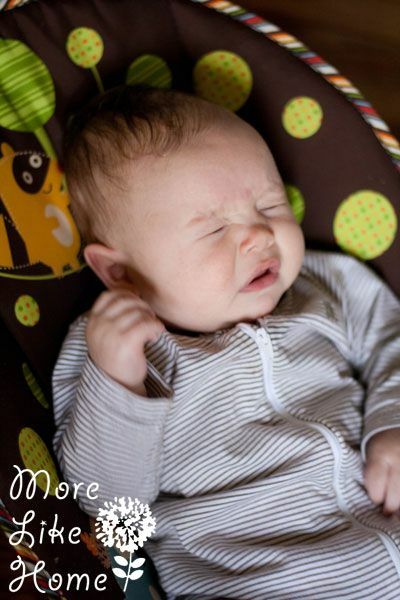 And he felt a little better about things. 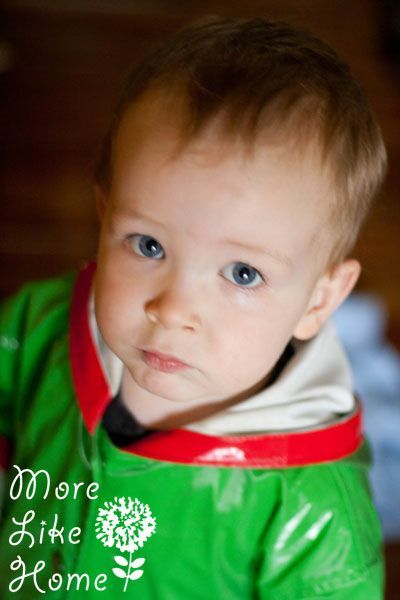 And please note the raincoat. He wore it all day. You're welcome, Beffy. But back to business. 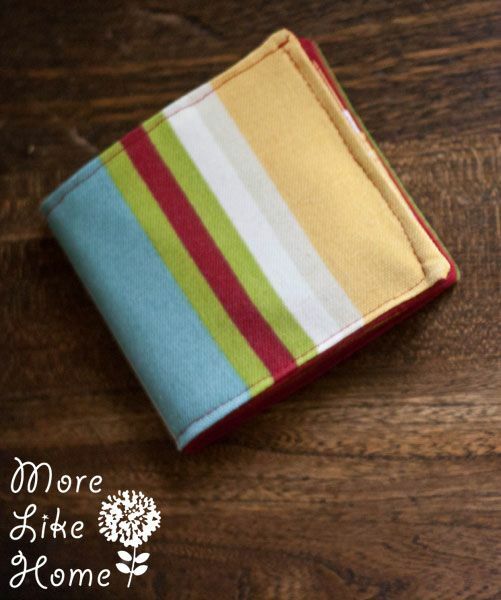 What would you do with a wallet? 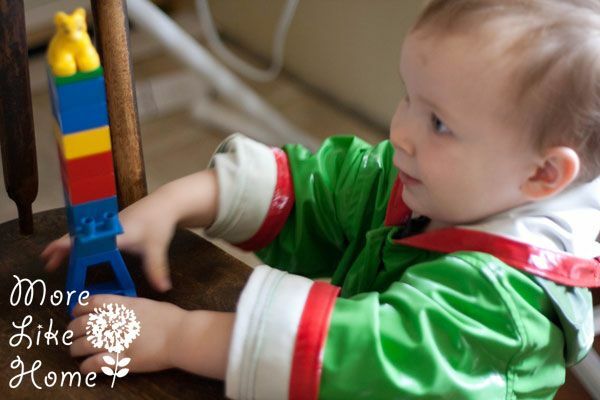 Would you use it as a stocking stuffer or pair it with another gift? Who do you want to make it for? 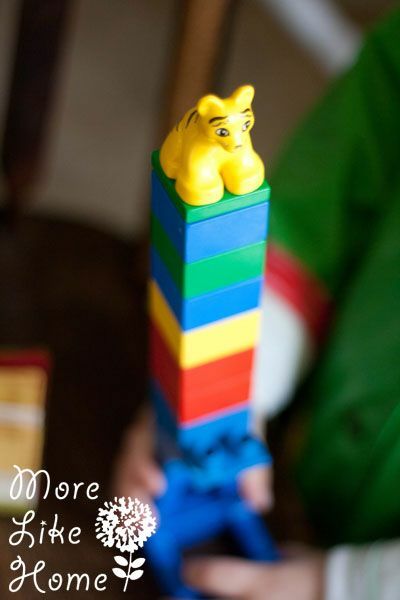 I'm going to make this! You're cool.